Rationale: Caffeine is present in a wide variety of beverages, often together with a number of other ingredients, such as sugars, taurine, glucuronolactone and vitamins. 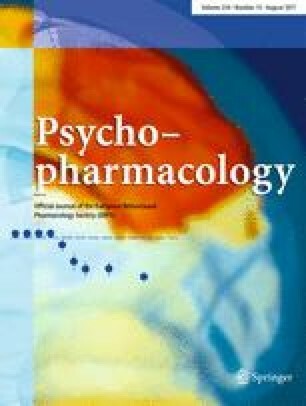 However, the majority of psychopharmacological studies have used pure caffeine tablets or drinks with doses in excess of those normally consumed in daily life. In addition, all the participants are usually deprived of caffeine for 10 h or more before the study. Consequently, it has been argued that any improvement in performance is only due to a reversal of caffeine withdrawal. Objective: The present two studies tested participants who had minimal deprivation from caffeine (an hour or less) with an 80-mg caffeinated (80 mg/250 ml), taurine-containing beverage (commercially available) verum, which also contained sugars, glucuronolactone and vitamins. The placebos in the two studies were a sugar-free and a sugar-containing drink, in order to examine the effects of the sugar. Methods: In total, 42 participants were tested with a rapid visual information test, a verbal reasoning test, a verbal and non-verbal memory test and a set of mood measures. Prior to testing, they were allowed ad libitum caffeinated beverages until 1 h before testing (study 1) and unrestricted caffeine use before testing (study 2). Results: In both studies, the caffeinated, taurine-containing beverage produced improved attention and verbal reasoning, in comparison with a sugar-free and the sugar-containing drinks. The improvement with the verum drink was manifested in terms of both the mean number correct and the reaction times. Another important finding was the reduction in the variability of attentional performance between participants. No effects on memory were found. There were no differences in performance between the glucose and sugar-free drinks. Conclusions: Moderate doses of caffeine and taurine can improve information processing in individuals who could not have been in caffeine withdrawal.